Find the service you want to monitor and click Edit. Check the "Enable monitoring" checkbox. Ping URL: Enter the Ping URL of your service, which we will ping periodically (HTTP HEAD requests) to determine if your service is up, it should return 2XX or 3XX status to signal its working properly. Notification recipients: You can select what members of your team should be notified when this service goes down/up, you can hold control/command to select more than one, you can add new team members by following the link provided there. Check Automatically create incident to have an incident created automatically when this service is down. 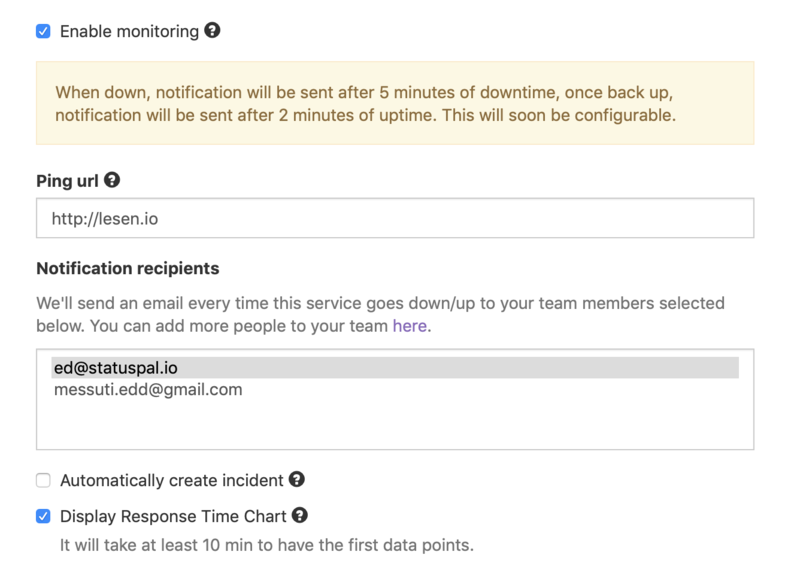 Check Display Response Time Chart if you want a response time chart in your status page for this service. Click on Update and you are done, your now have a monitored service!.